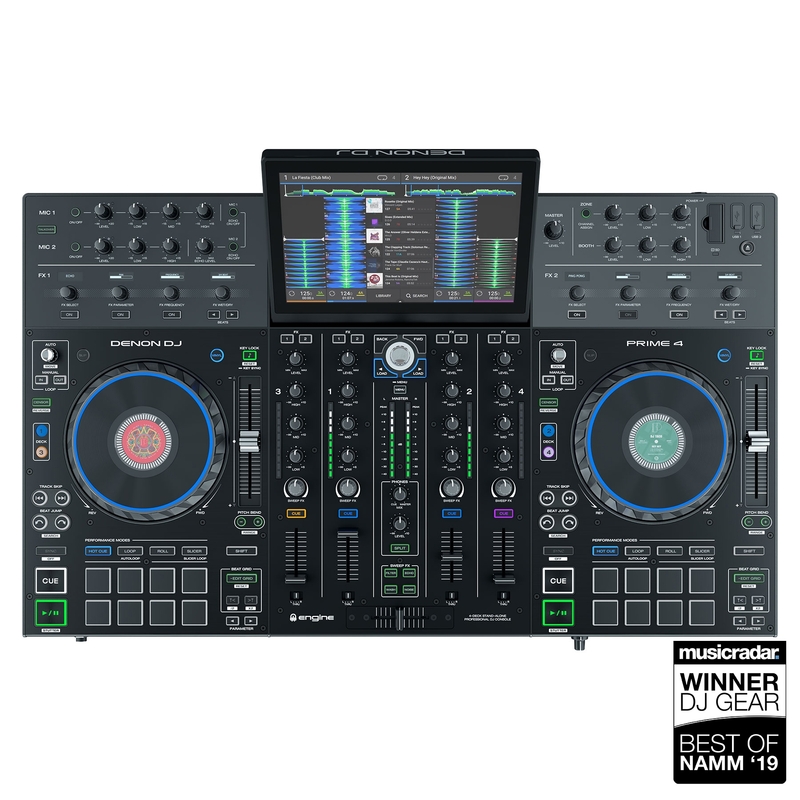 Prime 4 has been awarded the best 'DJ Gear' title by Music Radar at NAMM 2019! The 4-Channel All-In-One is Here! The Denon Prime 4 is the first 4-channel stand-alone unit on the market, but that’s not the only thing that’s innovative about this beast of a unit. The screen is a multi-gesture HD touch-screen so you can swiftly swipe and tap away to get to the tracks you want, and adjust the angle to your preference! 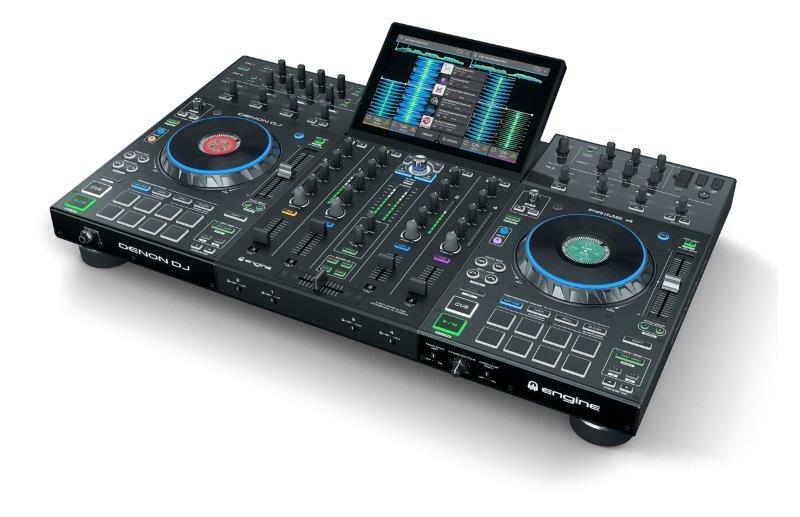 It’s also the biggest screen on a standalone unit in the market, with the ability to show all 4 waveforms at once. Line & phono inputs are available on each channel so external CDJs and turntables are no issue. The crossfader is fully replaceable too. 3-band EQs, FX and gains are on each of the 4 channels – it’s just like a pro 4-channel mixer in its own right. Along with track information, you can stick track artwork in the middle of the 6” ultra-responsive, rugged metal jogs – or whatever picture you like. Framed with an RGB light-ring which allows you to set it to whichever colour you like. Add a bit of branding to your set up! Enjoy 2 combi mic inputs with dedicated volume, EQ and effects controls. Perform loops, rolls, slicing, hot cues, split bars and split beats on the super-responsive pads. Engine will analyse your tracks on-the-go. 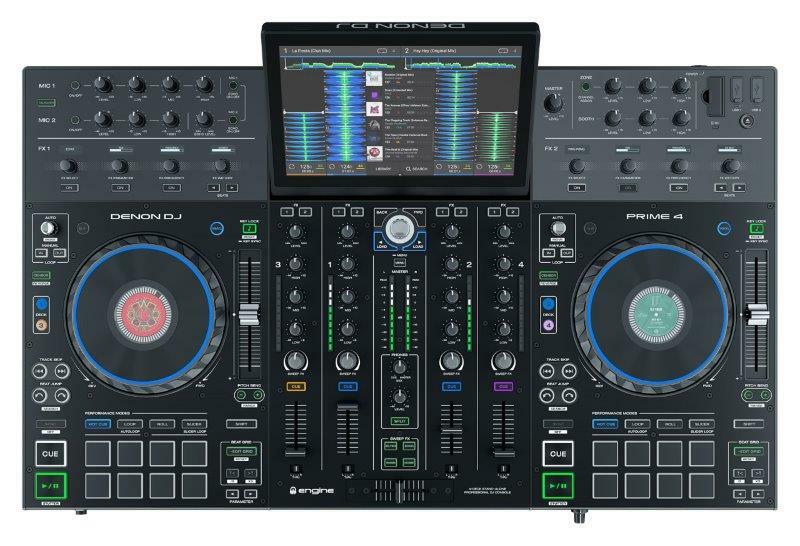 No pre-laptop admin needed, the Prime 4 uses its internal multicore processor to analyse your tracks while you’re Djing. Its class-leading production-quality time-stretching algorithm will allow extreme tempo changes with minimal effects to the track quality and allow you to shift to different harmonic keys seamlessly. If you don’t want to be navigating through playlists, plug in your USB keyboard and search for tracks in the easiest way possible. 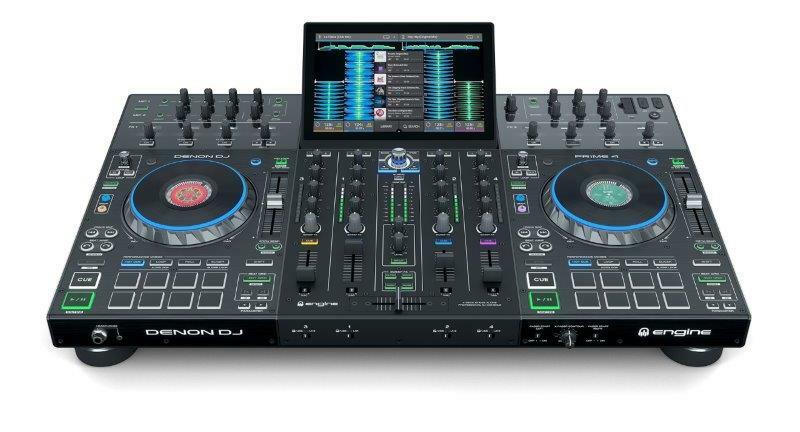 Denon DJ have made it super easy for you to move your library from Rekordbox, Serato or Traktor. Plug in up to a total of 4 USB drives. On top of that we’ve got an SD card slot and a 2.5 inch built-in SATA drive bay. Eliminate the need to even bring your USB drive with you. The Prime 4 will also have no qualms with lossless audio formats (FLAC, ALAC, WAV) and the output is a crisp 24-bit Denon DJ legacy audio. 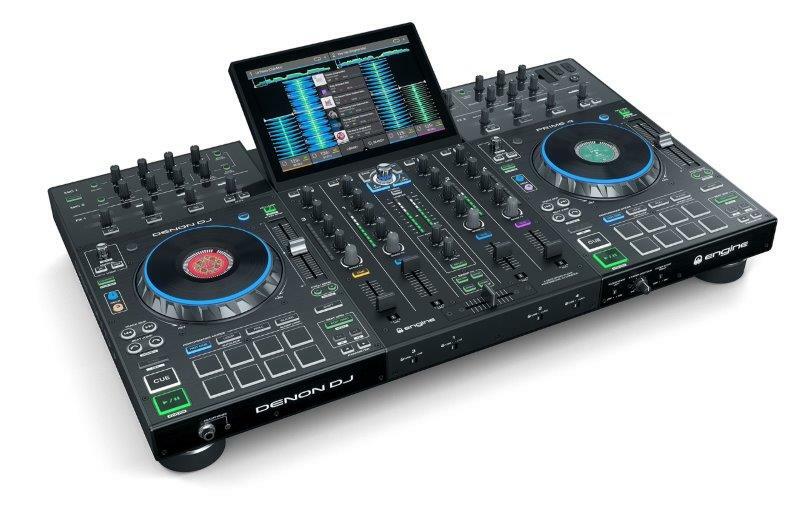 These are generally only on professional live mixing desks in venues, and they allow you to play a separate playlist of music to the 2nd room of a venue you’re DJing at. So you can still focus on the main room you’re in, but set a laid-back playlist to take care of the second room on its own - maybe on auto-mix or just playing through. The second room will be assigned to a channel on the mixer of your choice, so you can control the volume and EQ independently for each room. The StagelinQ connection allows you to use VJ & Lighting softwares Soundswitch, Resolume or Timecode on a laptop to control lighting in a venue in response to your mixes. MP3, FLAC, ALAC, WAV, via USB drive, SD card or SATA drive.